JONESTOWN, TX--(Marketwired - February 19, 2017) - General Tire pro Mark Rose of West Memphis, Arkansas, brought a five-bass limit weighing 14 pounds, 9 ounces to the scale Sunday to win $125,000 at the FLW Tour at Lake Travis presented by Quaker State. Rose's four-day total of 20 bass weighing 59-2 was enough to edge second-place angler Bryan Thrift of Shelby, North Carolina, by a mere 12 ounces. "I'm just blown away right now -- I'm speechless," said Rose, who has earned more than $250,000 in FLW Tour winnings in the past 15 days. "I've been doing this for a long time, and so has Bryan (Thrift). I think he is the best angler in the world, I really do. I had to give everything I had out there." "It's the same area that I caught fish from when the Tour last visited Lake Travis in 2007," said Rose. "I caught them on a rough spot with a big lip in 5 feet of water. Now the water is 40 feet higher and there are big trees growing out on the end of the lip." Rose said he used two baits to wrangle his bass out of the trees -- a 3/4- and 1-ounce Strike King football-head jig with a green-pumpkin-colored Strike King Rage Craw trailer, and a 6-inch shad-colored paddle tail swimbait paired with a 1-ounce Strike King Squadron Swimbait Head. "Those two lures caught my two biggest fish today," said Rose. "The jig was my most productive bait throughout the week. I used it to really get down into the trees. If the bass were up over the trees, I used the swimbait." "I used a Strike King Rage Bug with a 5/16-ounce tungsten weight," said Rose. "I probably flipped 30 docks and culled two fish late in the day." Rose said he credits the instincts he's developed over his 19-year career for helping him get his win. "Ten years ago I would've stayed deep and tried to catch another big one from the ramp," said Rose. "But today, it wasn't going to happen, and I had to trust that. I needed to leave and go catch a few that made a difference. I'm thankful for everything -- very thankful." Overall there were 42 bass weighing 109 pounds, 10 ounces caught by nine pros Sunday. The catch included eight five-bass limits. The FLW Tour at Lake Travis was hosted by the City of Jonestown and the Austin Sports Commission. The next event for FLW Tour anglers will be the FLW Tour at the Harris Chain presented by Ranger Boats, March 9-12 in Leesburg, Florida. 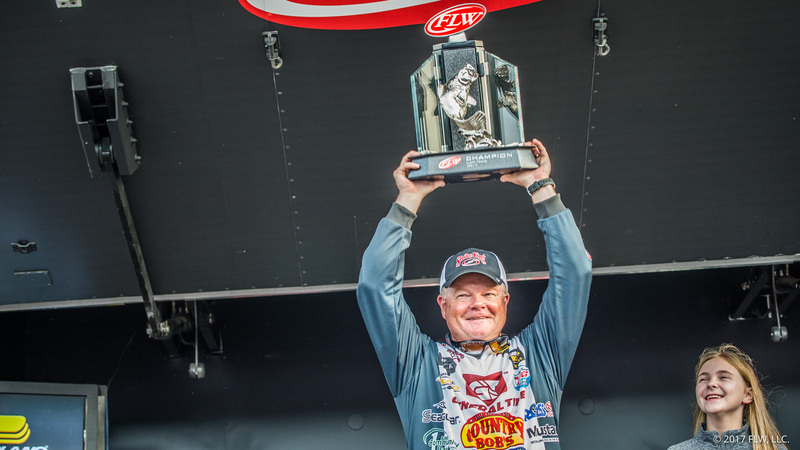 General Tire pro Mark Rose of West Memphis, Arkansas, weighed a four-day total of 20 bass weighing 59 pounds, 2 ounces to win the event and $125,000.